Komponist (1810-1856). 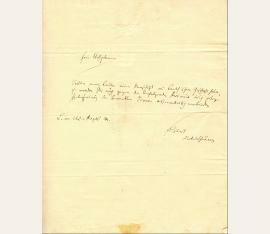 Autograph letter fragment signed. O. O. Ca. 55:210 mm. 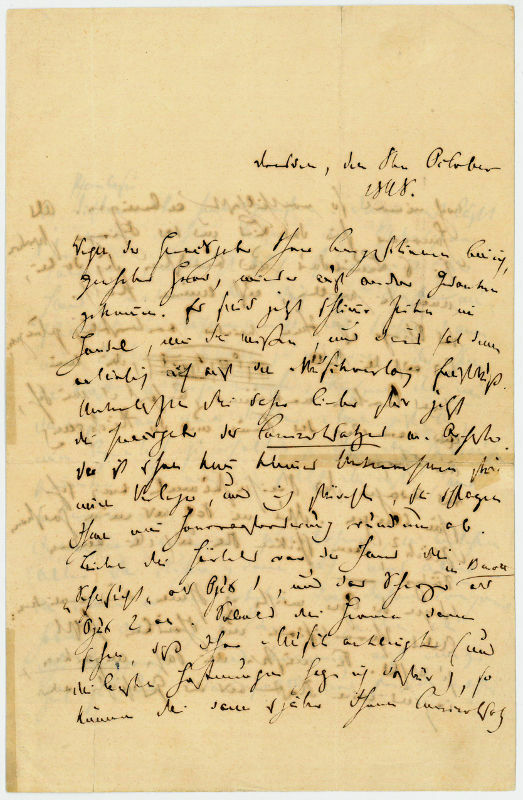 Concluding portion of a letter in which Schumann writes that he hopes to speak with his correspondent personally within a day or so. 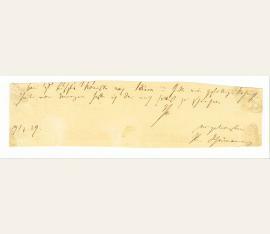 - In very good condition, with uniform toning, irregularly trimmed edges, and show-through from mounting remnants to reverse (affecting the last letter of the signature). Komponist (1810-1856). 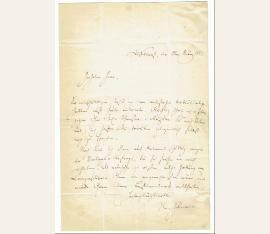 Autograph letter signed, and with a note example within the text. Dresden. 4 SS. 8vo. 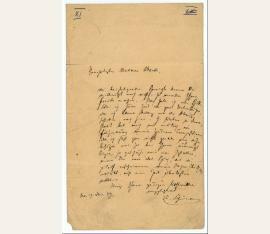 A very comprehensive letter to the German composer Carl Wettig, giving instructions concerning negotiations with the musical publisher Breitkopf & Härtel, and discussing Wettig's recent composition, of which Schumann cites a part from the scherzo (2 bars). 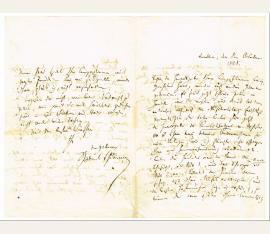 - Slight damage to paper (restored). Komponist (1810-1856). 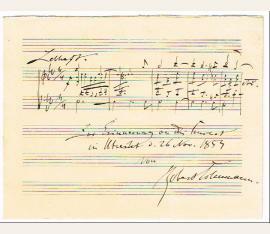 Autograph calling card signed ("R. Schumann"). O. O. u. D. 1 S. Visitkartenformat. 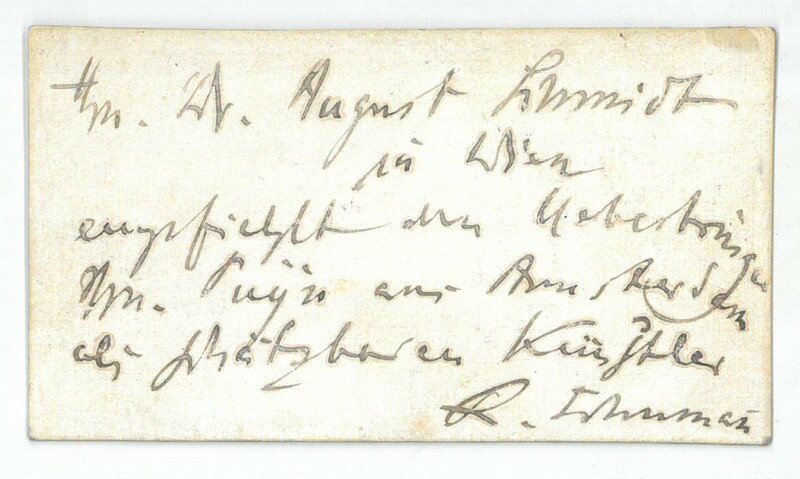 To the musical writer and musician August Schmidt (1808-91), in German, on the verso of his printed visiting card, introducing a musician named Puyn visiting from Amsterdam. - "64" written in unknown hand at upper right of printed side. Komponist (1810-1856). 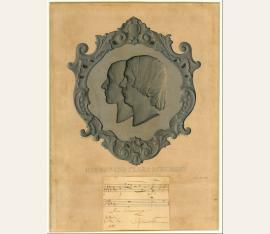 Steel engraving of Robert and Clara Schumann by Friedrich Schauer, with mounted musical quotation, signed and dedicated by Robert. Amsterdam. Portrait: Gr.-4to. 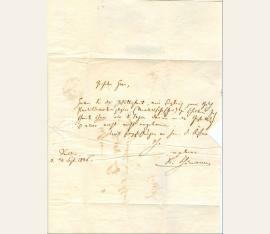 Das Billett mit Notenzitat, Widmung und U. im Format 65:80 mm. 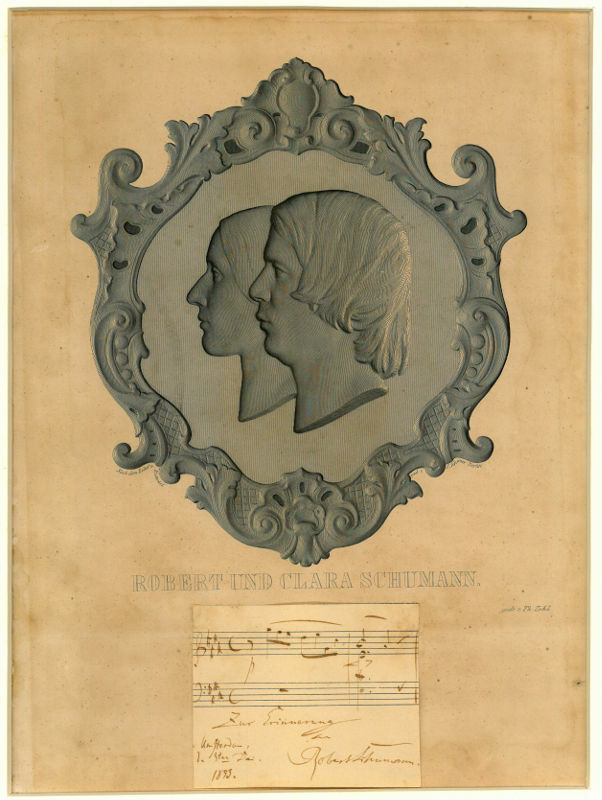 The well-known double portrait of Robert and Clara Schumann, dedicated by Robert to the Dutch soprano Sophia Huberta Offermans, née van Hove (1829-1906). 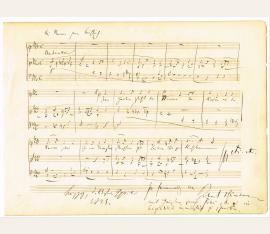 - The quotation cites two bars from the prelude "Paradies und Peri", op. 50. Komponist (1810-1856). 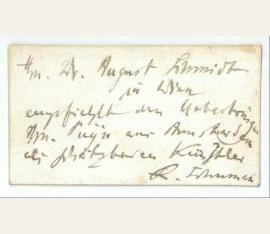 Autograph letter signed ("RSchumann"). [Leipzig. ½ S. Kl.-4to. Mit eh. Adresse (Faltbrief). 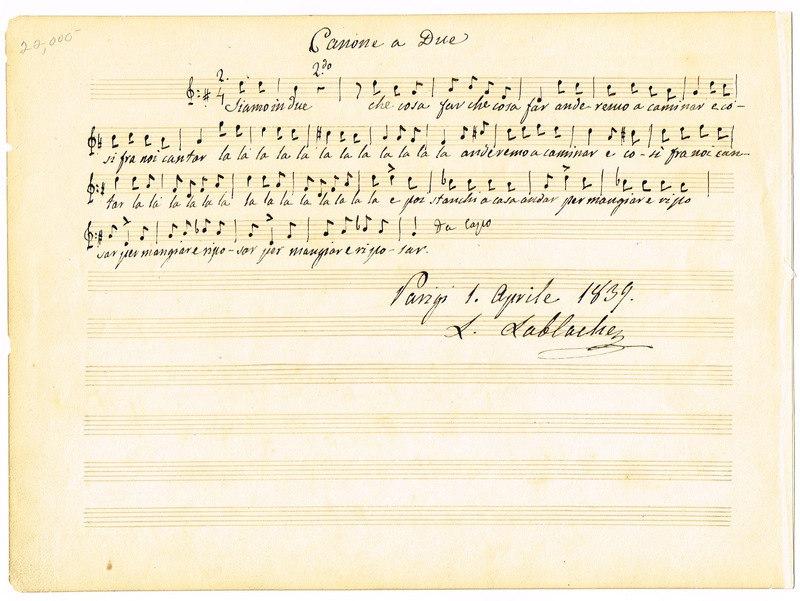 To the French composer and pianist Camille-Marie Stamaty, asking to send him his "Concerto", presumably Stamaty's Piano Concerto in A minor, op. 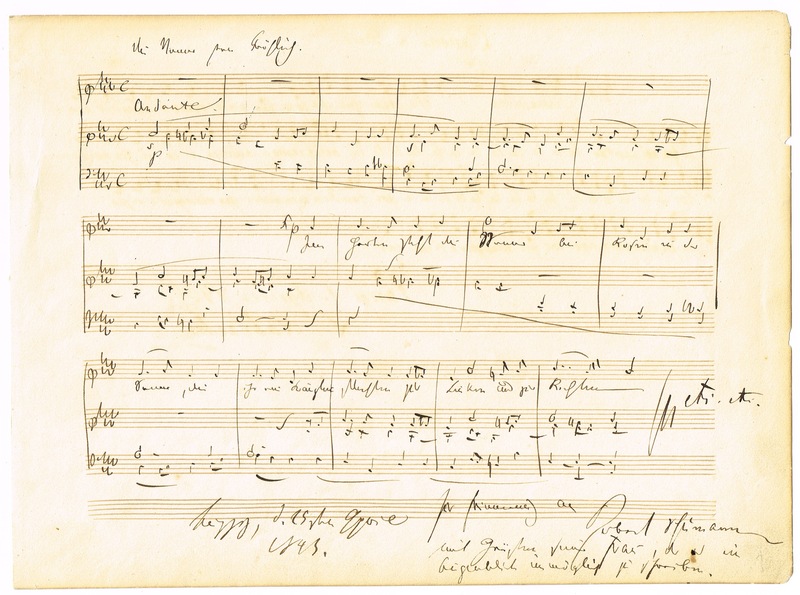 2, on which Schumann would publish an article the following year in "Neue Zeitschrift für Musik": "Ayez la bonté de m'envoyer par vôtre Mercure votre Concerto. Je le veux dévorer, m'affairer etc. Mad. Voigt vous attends aujourdhui: ditez à elle sur son jeu tout ce que vous voulez [...]". - Minor chipping due to breaking the seal. 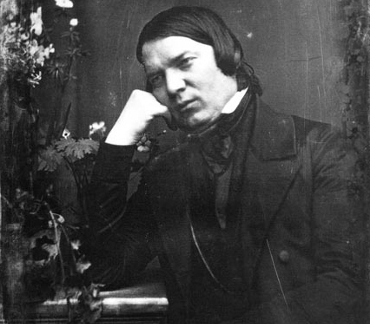 Robert Schumann (1810–1856), composer. ALS. 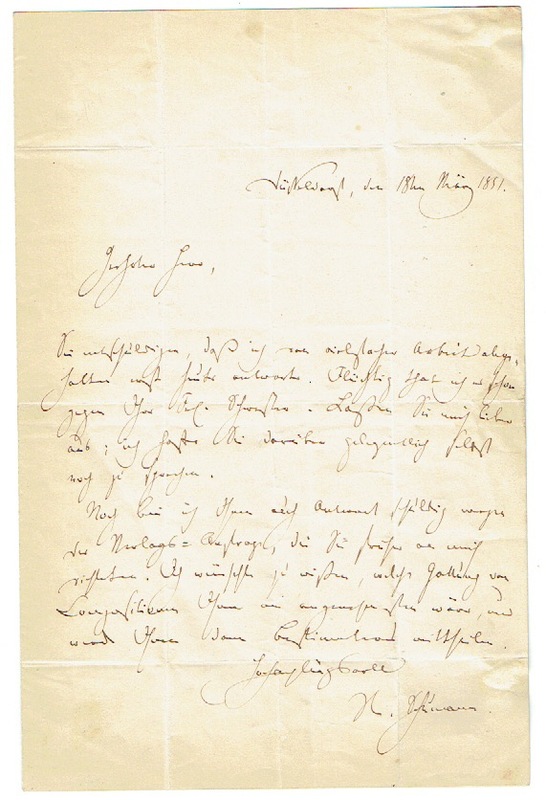 L[eipzig], 26 August 1834. ½ p. 4°. With autogr. address. 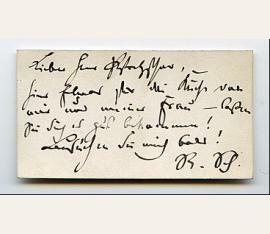 – In German, to Mr. Schulz, “proprietor of Barth’s Bookstore here”: “Should my brothers enjoy any credit at Barth’s, then you would find me most grateful if you could kindly send me the stated sum against the enclosed receipt [...]”. – Johann Ambrosius Barth jr. published Schumann’s “Neue Zeitschrift für Musik” from 1835 to 1837. – Slight edge defects; mounted on backing paper. Without the mentioned receipt. To the (unnamed) German composer Carl Ferdinand Becker: "Since you mention Sch[illing] in St[uttgart], it occurs to me that we really ought to mention his [Logiken] in the journal as, in effect, the most important recent literary undertaking (at least in quantity). Would you like to write such an article? There must be a superfluity of material for such remarks. Otherwise, as you say, Sch. is a most miserable man, to whom we should really pay no attention, but he knows how to look the public directly in the eye, and that really has to be said, briefly and clearly. Think about it. Another thing: I have asked some supporters of our journal to fetch Herr Erich for a weekly walk, on Sundays (at 11 a.m.), to have a mutual discussion about the journal, its weal and woe, to suggest and adopt alterations, where desirable, etc. etc. Would you like to take part in the walk? Please let me know soon. 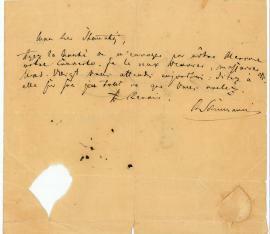 In a postscript, Schumann has added; I have already asked you for an essay on Marx's doctrine; do you remembering that? [Merz] wrote to me some time ago and asked for you" (transl.). - Published (in parts) in: Friedrich Gustav Jansen (ed. 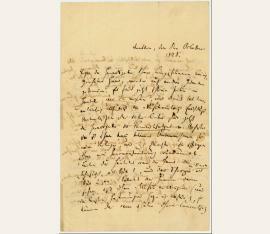 ): Robert Schumann's Briefe. Neue Folge. Leipzig, Breitkopf und Härtel, 1904, p. 155, no. 157. Lower left corner loose, but enclosed. 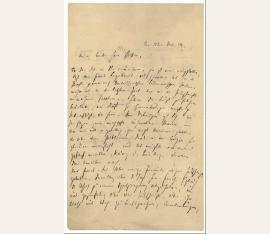 An unpublished letter to his future mother-in-law, Clementine Wieck, née Fechner, stepmother of his fiancée Clara: "Dearest Madame Wieck, you may not yet know the enclosed reports: they will give you pleasure. I still have one request. As I hear, the two music notebooks which I sent Clara shortly before the departure are still here. 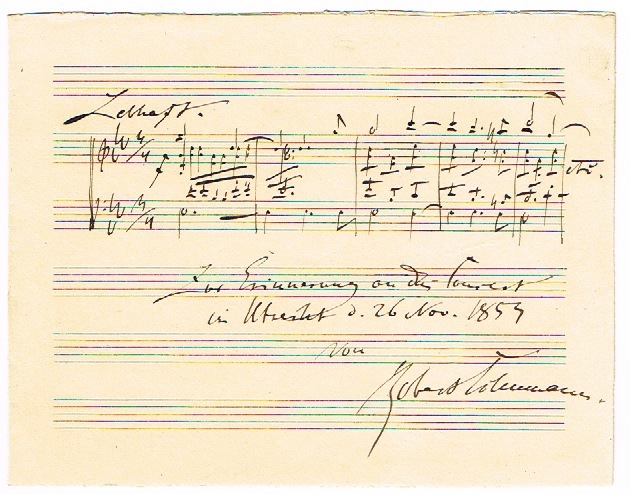 Lately, Gottfried Weber of Darmstadt asked me to send him my later compositions. As I am in possession of nearly nothing in this way and they are lying around, unused, at your place, it would be a great favour to me if you could let me for a while have the book, containing those most recent of my works (up to opus 14). 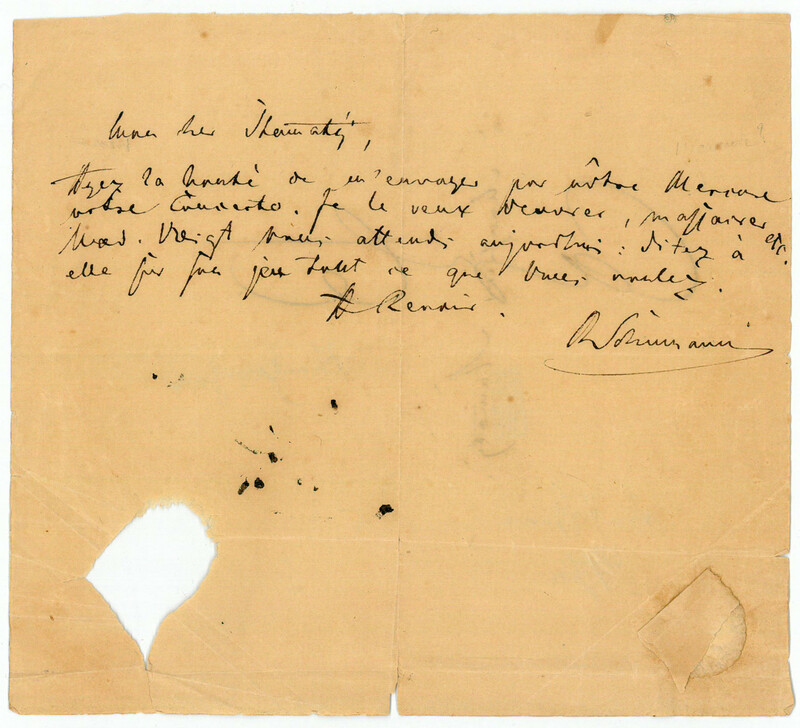 With my kindest respects / R. Schumann [...]" (transl. ).